In which the Parsimonious Princess tells you about how worms eat her garbage. 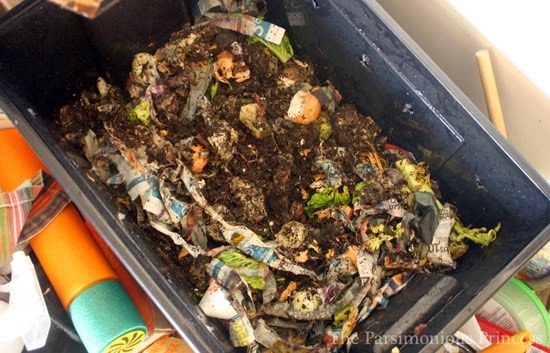 Add having a worm composting bin to the list of things I never imagined I would ever do. It's right up there with cloth diapering, raising chickens, and beekeeping. I can't even tell you how many times it makes me think of that part in Dumb & Dumber when Lloyd pitches his idea for a worm farm business. I remember how disgusting that sounded back when I watched it in high school. Who would have thought that someday I'd have a small sort of worm farm? Weird. I'm not entirely sure where I first learned about vermicomposting (aka, worm composting; vermis is the latin word for worms). I've had a regular compost bin the nine years I've lived in my house (the compost heap was one of the first things I did with my yard) and I'm always glad when I see worms in it. Not until last year, though, did I have a whole compost area devoted to worms. 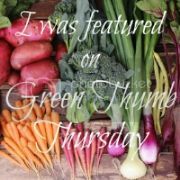 Last year, I started seeing pins on Pinterest about worm composting and I was intrigued. I read about people keeping bins in their small apartments or under the sink in their kitchens. I saw plans for tall worm compost bins that looked kind of like beehives. It seemed like a great idea to have worms eat food scraps and junk mail to help your garden, but it seemed a bit overwhelming, too. 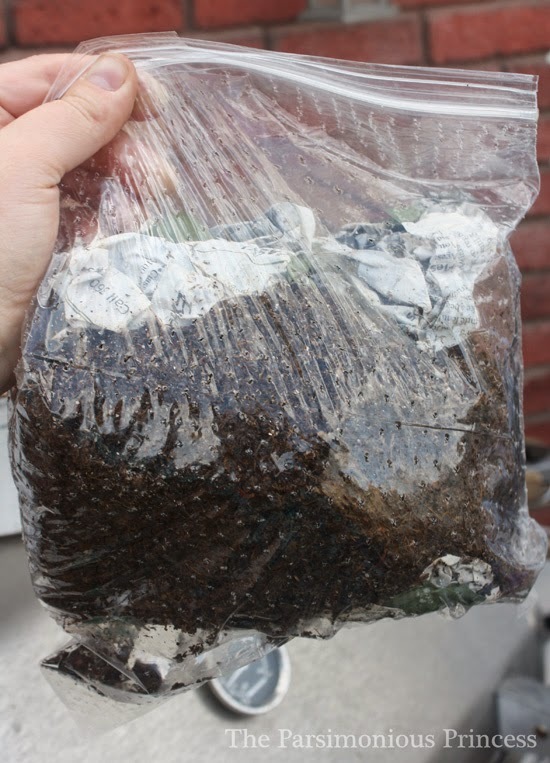 In this post, I'm going to share how to start vermicomposting and some insights to how it's working for us. Keep in mind, I've only done this for about a year and I'm still pretty new to this whole process and am by no means a worm expert (yes, they do exist). That said, it's been pretty simple thus far. First things first -- you need worms. Worm composting requires a certain type of worm: red wiggler worms. You can't just go dig around in your yard or go to the fishing bait section and pick up a bunch of earthworms. From what I've read, these specific worms thrive on eating bacteria-laden and rotten food. Getting a pound or two of red wiggler worms is easy. There are lots of places online where you can order them -- even Amazon has listings for worms. I ordered mine from Wiser Worm Farm (nope, I'm not getting paid in worms to mention them here -- I'd just read a lot of good reviews about them and ordered from them). 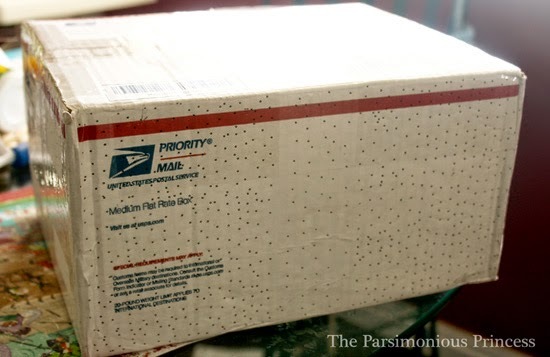 I got a pound of worms for $27, shipping included. Once you've got the bin and the worms, it's time to put those little wiggly guys to work! First, add some shredded up newspaper. I've been using grocery ads that come in the mail, along with my son's book order forms he gets from school (that is, after I'm done spending too much money ordering from them...ahem). Next, we added some food scraps I'd been collecting for the last couple days (more on what and what not to feed worms later). Now you can introduce your worms to their new home. Once I dumped them in, the kids started naming them. In our worm bin, there's a little red wiggler named Charles and another named Sammy. It didn't take long for the kids to.realize that it's hard to come up with 500 names. 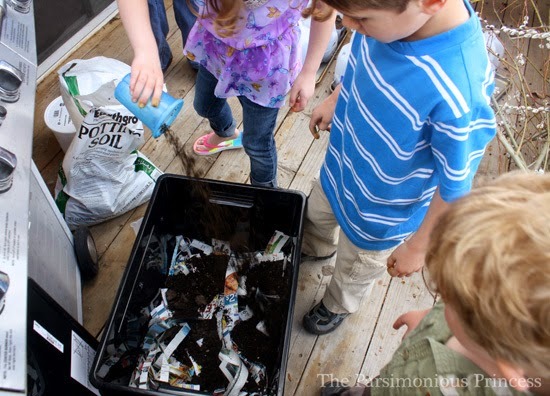 We poured a little water over the newspaper-scraps-dirt mixture and worms. 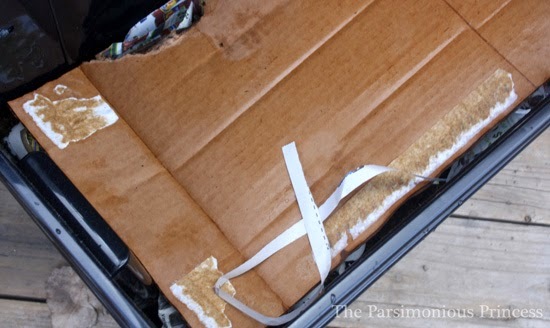 To top it all off, we added a wet piece of cardboard (to keep the light out from the ventilation holes). Put the lid on and the worms are ready to get to work! Once you've got them in the bin, now the fun part comes (I can't believe I said it's fun, but it kind of is). It's absolutely fascinating to watch them at work turning scraps in rich compost. What's great about vermicomposting is that it requires next to no work -- the main thing you have to do is make sure to keep them fed and moist. There are a few guidelines on feeding worms -- there are foods they can and can't eat. The way I keep it straight is to think of them as a bunch of wiggly little vegans, because worms can't eat dairy or meat. Unlike vegans, though, they also don't eat oils or citrus. What do worms eat? They like fruits and vegetables, breads and grains, eggshells, tea bags, coffee grounds (including the filter. We don't drink coffee at our house, but I've heard that worms love coffee grounds), and shredded newspaper. I've read that it's best to feed the worms food that's already starting to rot a little. This is where my compost pail comes in. Until just recently, I used this pail to hold kitchen scraps before taking them to the compost pile in the yard; now I use it exclusively for worm food. 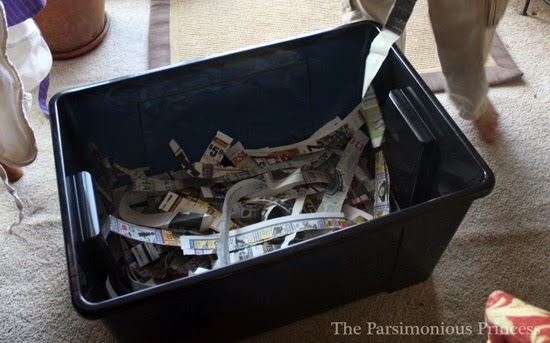 Since this pail can hold the stinkiest, most rotten stuff in it and you can't smell anything when the lid is closed, I let the scraps for the worms sit in there for a day or two and then dump it into the worm bin. Keep the bin's contents damp, but not soaking wet. 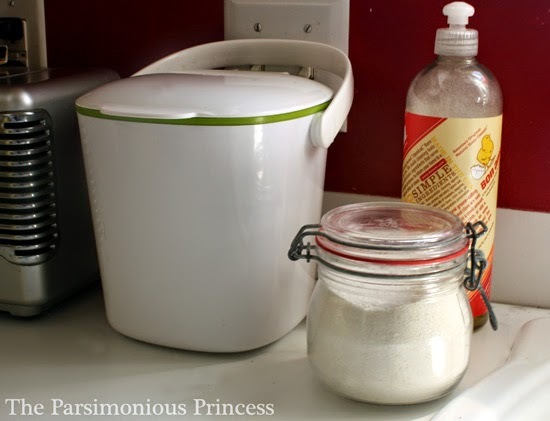 I keep a spray bottle filled with water next to the bin and give it a few sprays when things are looking dry in the bin. I also have an old hand rake next to the bin to stir things around when I add new food for them. This also helps with ventilation so things don't get too compacted. Don't keep your worm bin somewhere that's too hot or cold. You don't want it to be somewhere where it gets colder than 35 degrees or hotter than around 80. I keep mine in the garage (hence all the random stuff piled around the bin in the picture above). 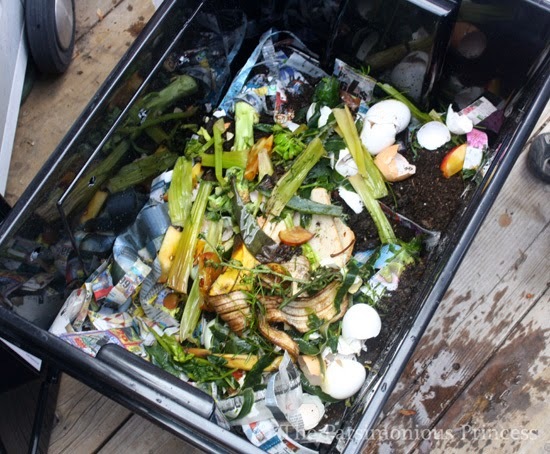 Like with a regular compost pile, the worm composter doesn't stink if you're doing it right. If it stinks, that's when some troubleshooting is needed (maybe it's too wet, there's too much food, etc.). When I open my worm bin, it has a sort of pleasant, earthy smell. I say this not to brag but instead to point out how not-hard keeping a worm bin is. Just as I'm fascinated by my compost pile outside, I find myself looking at the worm bin the same way. It's incredible to see a little sort of eco-system at work. I tried worm composting several years ago and ended up murdering my entire batch of worms. I have to confess that I have not tried it again since - though you make it sound easy enough that I probably should! I have many questions. I may need to call you. I have friends who have done worms and at least one gave up b/c she said she had to basically self-sort the compost -- fish out the uncomposted bits and the worms in order to get the dirt. I think the benefit of the commercial ones is the "trays" so that the worms on their own crawl out of the finished soil upward into another tray with newly discarded food/ paper/ etc. Am i missing something? I had a single bin worm bin like yours a few years ago, and I finally ended up with so much moisture in it that the environment because anaerobic, and the worms kept trying to escape (a problem since I kept it in my laundry room). I eventually killed them by mistake when putting the bin outside to try and get it to dry out, and they all froze (oops). I waited a few years, and then did a two-bin system, where I drilled drainage holes into the bottom of the top bin, and excess water can drain into the lower bin, where I can then pour it out. I've had this system for a year and a half so far, and it seems to be going much better than the first attempt. Only issue is like Betsy posted above; I have to manually separate out my compost from the worms when the bin gets full.